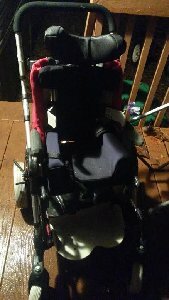 This Kid Kart was only used for a few months until my son's wheelchair was ready. This will hold up to 55lbs. It has a space underneath for storage if needed. It is pretty light weight if you plan on transporting it from place to place. I am a female and I'm able to lift it with minimal ease.